﻿ The Infield - Ohio. Find It Here. 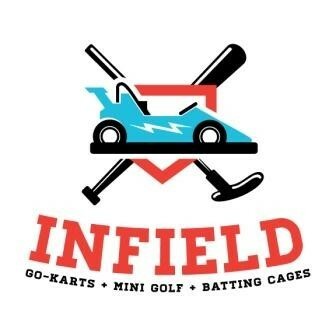 Conveniently located in downtown Lexington, Ohio, The Infield outdoor amusement park features Go Karts, Batting Cages with various pitches and speeds for Baseball and Softball players, 18-hole Putt-Putt Golf course, Arcade games, and snacks and beverages. 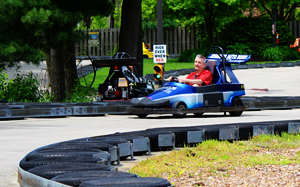 Go-Karts run on two tracks, accommodating drivers 4 years old (40 tall) and older. Race time is 5 minutes. 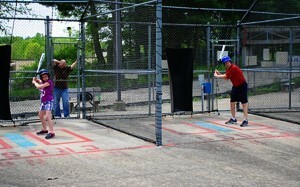 Batting cages accept tokens that pitch 15 varying balls and strikes per each session. Cages offer slow and fast pitches for Softball players and pitch speeds of 40, 50, and 60mph for Baseball. Helmets (required) and bats are available for use at the front counter. 18-hole Putt-Putt gold course features hills, water attractions, and obstacles sure to challenge the avid Putt-Putt competitor. Golf clubs, golf balls, and score cards are available at the front counter. Arcade games are located in the enclosed entrance, along with snacks and beverages.